As a kid I was an avid reader. Truth be told, I still am, I just don’t have as many free afternoons to curl up on my bed with a book and read 400 pages at a time! Nothing can lure me like a good story. When I got a little older, I was the one who coerced my younger siblings into dressing up and acting out plays in dance form, even before I had ever taken a dance class. Being part of a story was as good as reading one. I loved doing this so much that I made it my job when I grew up. Now I travel all over the world doing exactly the same thing: dressing up and dancing out stories. Artists of any genre are storytellers, dancers among the rest. We are silent actors, conveying a myriad of emotions through body language: a lifted shoulder, a quick glance, a hasty reach… we become the character we are portraying. Jesus was a storyteller too. In fact, it’s how he seems to have done the bulk of his teaching. Stories stick with people long after “the end”. They invite a closer look and cause the point of the message to sink deeper. Stories are fascinating and have an ability to make the listener feel part of the story. I have a story worth telling. A story of despair and salvation. A story of hope in the face of the impossible. A story full of unexpected twists and cliffhangers. A story of a prince who rescues and marries the beggar girl. There’s a million ways to tell it because we all have the same story. Much of the power of dance lies in association and empathy. When I dance, I become the character I am portraying and bring my own real life experience into the story. Sometimes it’s hard because it always requires vulnerability. But when art contains transparency and authenticity, it rings true for the audience. They are able to see themselves in the story. As they relate to a story of brokenness, of fear, of longing, of waiting on hope, or whatever the struggle may be, they see themselves in me. Many people have told me after a performance that I danced their stories. Their stories were all wildly different. But no matter the details, they could identify with the emotion, the heart cry. This gives me the opportunity to offer them an incredible gift because every story moves from conflict to resolution. The audience may not have reached the resolution in their own lives yet. They may not have the peace of God or a relationship with him. But when they watch a story that moves from dark to light, they are given the chance to move from darkness to light in their own lives. Because they identified with the broken character on stage, they have essentially watched healing occur in the story of their lives. They leave with the possibility of saying yes to God as he makes it a reality. This is my prayer and hope at every performance. I dance, yes. But in a way, my job is more intercessory than anything else. Does it actually work though? Do people take hold of the gift? I faced this question early in our ministry. Would lives be changed? Would people embrace healing and wholeness? Could people be brought into the Kingdom through a dance? 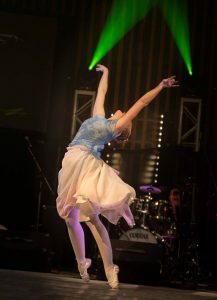 Once somebody told me, “Dance is all very nice, but you’ll never see anyone come to know Jesus through it.” It haunted me for years and early in our touring ministry I put it to the test. I brought that person’s statement before God and said, “I want to know if what I do makes a difference. If this is worth doing, I want to see someone come to know you on this tour.” We were headed to the east coast of Canada and the production was Ode to the Broken: the story of someone who lives a life of depression, abuse, and despair but is rescued by God’s love and forgiveness. It happened. One night I danced that story on a tiny, carpeted platform, in a little church in New Brunswick. A man in the audience followed that story out of his own brokenness and into salvation that night. Storytelling was powerful 2000 years ago. It’s just as effective today. Since that day we’ve heard countless stories of people who have embraced healing and a deeper relationship with their Creator. Because of a dance. You may not dance, but if you are part of the family of God, you have a story. Tell your story. It holds out a unique light in the darkness. It’s important.